And… if that’s true in a wood shop, it’s 3X as true when it’s a business your livelihood depends upon. Most folks drift through life barely ever touching a single solid fact or hard truth. Their entire life, business and relationships consist of flimsy opinions. The blind lead the naked. In business, “bent nails” = constantly starting things, then starting over again, then again…. eventually ending in a downward spiral of depression and demoralization. And divorce. He says, “Perry, you know how people say marketing is Traffic and Conversion? That’s incomplete. It’s Traffic AND Conversion AND Economics. Good marketers know that great marketing can’t fix bad Economics. “But it’s also something else. It’s 80/20. 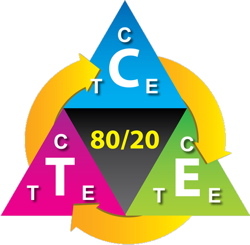 80/20 is in the center, because everything revolves around inequality. Jack says, “Look at Traffic. It’s a Google ad. The “T” of Traffic is impressions. The “C” is clicks, and the “E” is cost per click. Just the act of clicking on an ad is a complete marketing event with a miniature T, C and E.
DANG! Now Jack SERIOUSLY had my attention. This became a whole chapter in 80/20 Sales & Marketing. This laser-focuses your energy because at any given moment, you only need to work on ONE thing. Traffic, Conversion, Economics, or 8020. Then, Jack’s idea became a 3-day seminar at Rosetta Stone. There I kept zooming in, turning the gemstone and looking from every angle… by the time I was done I had a location within the Triangle for EVERYTHING IN MARKETING. Even advanced stuff. Like the Unlimited Traffic Technique; like Richard Koch’s Simplify and Star Principle; Network Effect and Marketing DNA. On day 3 I showed how it goes 3D… and incorporates metaphysical and theological ideas like Spirit and Logos, Mass Movements and Epic Story. Tactical Triangle is exhibit “A” of “Bottom of the Swamp.” A truth so deep nothing can dislodge it. A truth so universal that it swallows everything. Books and ideas that deal at this level of depth are called “Supertexts.” Ideas that are bottomless. Example of a supertext: The Cain and Abel story in the Bible. Abel makes a sacrifice. So does Cain. God LIKES Abel on Facebook, but rejects Cain. Cain gets angry. Cain kills Abel. Then Cain becomes a fugitive for the rest of his life – a universal symbol of malice. The Cain and Abel story takes maybe a paragraph… but it describes every blood-match in the history of humanity. It’s a supertext. A supertext is a tool that explains and untangles an endless array of problems. If your business, your product, your problem-solving is based on a supertext thinking, it will last a LONG time. It will weather the most ferocious competition. 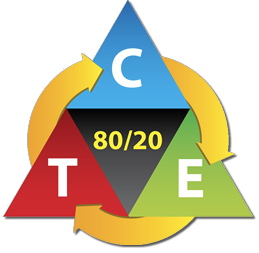 80/20 Sales & Marketing is a supertext. It will still be 90% current in the year 2050. Why? Because its based on fractal 80/20 – the most fundamental law of cause of effect on earth. And the Tactical Triangle which is a supertext-level concept. I’m not merely teaching supertext marketing ideas. (Lots of people do that.) I’m teaching you HOW TO DISCOVER AND CREATE SUPERTEXT IDEAS AT WILL. It’s about creating products, businesses, disruptions, ideas and industries that eclipse all others – encompass all others – swallow all others. The acid so powerful it eats everything. It’s about creating engines that endure – so you can finally stop nailing jello to the wall. Even if you only reach a “C Minus” facility with supertext ideas… your thinking process will be superior to 99.5% of all others. If you get to “B Plus,” you’ll topple industries with ease. If you get to “A,” school children will read about you in history books for the next 500 years. 50% of all “experts” are educated derelicts. But master this and you won’t care about those jokers – because your work will endure the ravages of time. Theirs will be lost to the mists of history.